Designation: University Professors’ and Department Directors’ Perceptions Regarding Support for Freshman Academic Performance. Copyright: © 2019 Sauer K. This is an open-access article distributed under the terms of the Creative Commons Attribution License, which permits unrestricted use, distribution, and reproduction in any medium, provided the original author and source are credited. Worldwide a significant number of higher education students enrolled in colleges do not graduate, negatively impacting their families’ economic situations as well as national development. The purpose of this qualitative bounded case study was to gain a deeper understanding of the perceptions held by math, English, and general education professors regarding the support provided to freshman students in a program at 1 campus of a private Chilean university. Deci and Ryan’s selfdetermination theory emphasizing internal and external motivations comprised the conceptual framework. A purposeful homogeneous sampling was used to identify the participants. Data collection involved semi structured interviews and member checks to triangulate the data. The findings revealed that interviewed participants perceive they might support freshmen students improving their academic performance, raising student passing and graduation rates and positively impacting national development. Academic performance, Freshman students, Higher education, Perceptions of professors, Remedial courses or programs, Support. The local problem addressed in this qualitative case study was how professors and directors of math, English, and general education (MEGE) classes perceive that they can support the freshman students of the economics and business program (EBP) of a private Chilean university (PCU) to improve their academic performance in MEGE courses. This study was conducted at the PCU’s largest campus, where 1,850 students studied in the EBP during the 2015-2016 academic year (AY). The 2015- 2016 AY freshman cohort was composed of 260 freshman students. University officials, administrators, and academic staff needed to understand MEGE professors’ and MEGE directors’ opinions to assist students to improve graduation rates. Worldwide higher education students face many challenges that may negatively affect their academic development and delay the completion of their professional degrees. The most significant challenges these students must overcome include inadequate academic preparation, scarcity of economic resources that compels them to work while attending university courses, and lack of knowledge regarding appropriate strategies for learning and studying. All of these factors prevent students from fully committing to their studies. PCU faculty realized the importance of identifying, assessing, and understanding the primary factors that prevent students from graduating on time. An understanding of the significant obstacles that prevent students from graduating enabled PCU administration to develop appropriate strategies to support students in their learning process. Consequently, higher education students may have the possibility of minimizing the time required to obtain their degrees [1-3]. The development and growth of a country’s economy hinge, to a great extent, on the spread of knowledge that occurs in institutions of higher learning . Postsecondary students should internalize higher education knowledge and develop the skills required to improve quality of life in their communities. Higher education students’ new behavior of responsibility and commitment should provide social benefits to their countries . The number of students enrolling in Chilean postsecondary institutions has grown steadily over the last 25 years , yet education officials are concerned because each student cohort exhibits weaker preparation than the ones before . Therefore, higher education officials should strive to improve the development of each student’s learning process [8-9]. Much of the literature on the students’ academic weaknesses subject advocates for ways in which university freshmen can improve their own academic performance and calls for faculty to support the development of each student to minimize dropout and withdrawal rates [7,10- 11]. The major challenges and the efficiency indicators of postsecondary institutions are retention and graduation on time [12-13]. However, one additional concern for postsecondary institutions appears to be student withdrawal or nonattendance due to negative social, economic, and personal factors . Attendance improves students’ learning opportunities and is key to achieving successful academic performance [11,14]. Additionally, increased attendance rates improve completion rates [1,3]. Altogether, a negative relationship is also noted regarding class absenteeism , student anxiety, and student performance . As nonattendance rises, performance falls. This qualitative case study addressed the support that freshman students require in order to improve their academic performance in MEGE courses. Closing the gap between theory and practice may provide key data to assist EBP freshman students in building greater confidence in their capacity to improve their grades in the classes in which they are enrolled and should be attending. RQ1: What are the perceptions of the MEGE professors and MEGE directors at one PCU campus regarding how they can support the freshman students in the EBP to improve their academic performance in MEGE courses? RQ2: What are the perceptions of the MEGE professors and MEGE directors at one PCU campus regarding the additional academic support services the university might provide EBP freshman students to improve their academic performance in MEGE courses? The first goal of this case study was to identify whether the MEGE professors and MEGE directors were willing to assist freshman students. In pursuing this first purpose, I sought to appraise whether the MEGE professors felt prepared to support the EBP freshman students in improving their academic performance in MEGE courses and to access their level of enthusiasm for such support. The second goal was to explore whether professors and directors believed that the university provided them with the necessary tools to support freshman students. Understanding how to improve students’ performance in MEGE courses and identifying which academic support tools students prefer may enhance university student’s retention and graduation rates. The conceptual framework for this study was based on the self-determination theory (SDT) of Deci and Ryan [17- 18]. SDT identifies intrinsic or autonomous motivation and extrinsic or controlled motivation as the origins of human behavior. Intrinsic motivation is a more potent driver of learning than extrinsic motivation because individuals voluntarily choose to execute an action . In the case of extrinsic motivation, the motivation is an external reward that can be gained or avoidance of punishment [19-20]. When people perform an activity because they find it interesting, intrinsic motivation is the driver that motivates them to act. In contrast, when people work under pressure, extrinsic motivation is the driver that guides their behavior . Self-determination theory was pertinent to the issue addressed by this case study because provides meaningful understanding of the drivers that support students in their learning process. Students who pursue higher education degrees must develop appropriate learning and studying strategies in order to be successful . The first step that students can take to develop appropriate learning and study strategies is to identify the significant value of having a degree and achieving a high level of competence in the labor market . Having the aspiration to pursue higher education is as important as cognitive ability, because that is what motivates students to keep studying in pursuit of high academic performance . When the consequence of freshman students’ learning efforts is improvement in their academic performance, they experience a positive appraisal of the value of their learning task through their grades . The improvement of freshmen’s academic performance (as evidenced by improved grades) can motivate them to continue studying, thereby starting a virtuous cycle and leading to improved overall performance [24-25]. Then the positive relationship between students’ efforts and their achievement contributes to persistence , thereby improving retention rates  and increasing student completion rates. Favorable attendance rates and academic engagement increase students’ skills and knowledge, thereby positively impacting students’ grades [1-2]. Furthermore, Crede et al., Ilgan, Mearman et al. [12,28-29] found that attendance has a positive impact on students’ engagement, performance, and retention rates. Students who attend classes learn more than students who skip classes, as they may ask their professors to clarify issues until they understand the topics. According to Reisel et al. , student participation in classes is beneficial, as it gradually supports improvement of their grades. In contrast, as Arulampalam et al., Cafarella and Miranda [15, 23, 31] identified, student absenteeism has a substantial negative impact on academic performance and thwarts success. Students should commit to their higher education and become active participants in their learning process . Factors such as a student’s confidence in grades, independence, goals, motivation, empowerment, autonomy, enjoyment, and pride, as well as supportive family and friends, are predictive of success for higher education students [22,26,33-38] underscored the fact that students who are confident of their academic ability handle challenges with stronger motivation and experience learning tutorials as supportive tools to improve their knowledge. However, Siegle et al. and Yun-Chen and Shu-Hui  realized that students also appreciate teachers who are passionate and humorous, use different methods to teach, hold students responsible for their own learning, are charismatic, and are knowledgeable. Professors who exhibited the aforementioned qualities become the foundation of the students’ learning experience. Bowman and Denson and Raelin et al. [33,36] identified institutional fit as another important topic, noting that a student’s higher education fit positively influences college satisfaction, persistence, and resiliency. Bowman and Denson  described a positive relationship between persistence and college contentment and a negative correlation between isolation and persistence. Finally, McEwan and Strom and Savage [26,41] established that the freshmen’s social environment influences their educational process and decisions regarding degree attainment. Additionally, Bush and Walsh, Johnson et al., Stillisano et al. and Termos [14,42,43,44], found that attendance and active learning behaviors, such as collaboration and teamwork, do have positive impacts on student academic performance. Flynn and Spittle [1,45] recognized that improving student engagement may increase retention rates. Moreover, Martin et al. and Reeder and Schmitt  established that those students who were clear about their postsecondary goals showed higher academic motivation and willingness to work diligently, which allowed students to develop resilience and improved their academic decisions . Chien  noted that learning occurs when students trust their teachers’ teaching methods. Teachers may help students to solidify their commitment and develop an active learning approach in regard to new challenges. Tovar  established that interactions with institutional agents affect students’ success and persistence. These studies point to the fact that students who do not develop appropriate behaviors are likely to fail . Faulconer at al. proposed that higher education institutions develop and adopt early warning systems that may support students’ efforts to improve their academic performance. The requirement of early warning systems arises because students who take responsibility for their learning in the university achieve higher academic marks than other students who apportion that responsibility to external factors such as faculty members and part-time academics [35,51]. Basitere and Ivala and Schnee [8-9] identified the responsibility that higher education authorities have to identify deficiencies in their students’ knowledge and to determine appropriate strategies to support them in developing a successful learning process. To study perceptions regarding support of EBP freshman students’ efforts to improve their academic performance in MEGE courses, a qualitative research model was the appropriate methodology. The qualitative approach is an interpretative one  that relies on human perceptions (Stake, 2010). Within this approach, “reality is socially constructed”  and is shaped by an inductive format based on personal perspectives from which broader patterns and understandings are discerned . Accordingly, there may be multiple interpretations of the same event, given the experiences and perceptions of the observers . A significant concern for qualitative researchers is ensuring that they are capturing participants’ perspectives accurately . Qualitative researchers seek to understand perceived experiences, rather than to establish cause-andeffect relationships [56-57]. The designs of qualitative research projects emerge in the course of accommodating the purpose and the questions of the study. This qualitative study was a case study. In a case study, researchers pursue in-depth descriptions of a bounded system , which means that the case is limited to an extension of time or a place defined by physical boundaries . The participants were chosen among the professors who taught MEGE courses to freshman students of the EBP at one campus of a PCU and also among the MEGE directors. The purposeful homogeneous sampling process was used to identify the participants. Within this approach, the professors who exhibited similar characteristics (taught MEGE courses to freshman students of the EBP 2015 cohort or were MEGE directors) were chosen to be part of the sample . Therefore, in the case of the MEGE professors, I established a performance grade within each freshman class section of the MEGE disciplines. The performance grade allowed me to identify the class sections where the students learned more, through their grades. My goal was to appraise whether those professors implemented some specific strategies that might have supported their students in improving their academic performance at the university. This study was bounded in one EBP campus. Specifically, data were compiled through interviews with nine MEGE professors who taught the 2015 EBP freshman student cohort. Three MEGE directors also agreed to be interviewed. After receiving the PCU’s IRB approval the MEGE departments were asked for permission to identify the professors who taught MEGE courses to freshman students of the EBP at one campus of a PCU during AY 2015-2016. In addition, I asked them to download the archival contact data (email address and cell phone number) of those professors. Potential participants were reached by cell phone and invited to participate in the qualitative research project. Those academics and directors whom I was unable to contact by phone were emailed with an invitation to participate in the qualitative research project. In both cases, the invitation stated the purpose of the study, as well as the informed consent. Potential participants were also told that there was no reward for taking part in this study. To select the number of MEGE professors interviewed in this study I established a performance grade based on the average class score of all of the students who belonged to one particular class. To calculate the average class score, I used a weighted average score. The weighted average score was 50% attendance and 50% grades. The procedure allowed me to identify three clusters. In Chile, grades are ranked on a continuous scale from 1.0 to 7.0 (1.0 is the lowest, 7.0 is the highest, and 4.0 is a passing grade). Thus, the class sections that received an average class score equal to or above 5.6 comprised the first segment. The second segment consisted of the class sections that received an average class score between 5.5 and 4.0. Finally, the last cluster consisted of the class sections that received a score equal to or below 3.9. It is important to note that currently, in Chile the passing grade is above 4.0, but this was not considered for the purposes of this study. Through this process, nine MEGE performance grade clusters (three for each MEGE discipline) were identified. One professor from each of the three groups within each of the three subjects was interviewed, for a total of nine MEGE professors, in order to understand the MEGE professors’ perceptions in depth . In addition, the three MEGE directors were interviewed. Consequently, a total of 12 participants were interviewed for this study. Measures were taken to protect participants from harm in compliance with the guidelines established by PCU University’s IRB. To protect participants, names and any information that might enable identification of the MEGE professors and MEGE directors who participated in the qualitative research project were removed [56,58]. Pseudonyms were used to protect confidentiality [52,56,59], and I worked to ensure that the data would not embarrass or harm the participants in any way . At the beginning of the interviews, the significance of the consent form was explained, and participants were asked to sign the document. The methodology of this qualitative case study involved individual face-to-face, semistructured interviews with open-ended questions. With this approach, researchers ask questions of participants and record their answers, allowing the interviewees to express their opinions, perceptions, and ideas with privacy . My goal was to encourage the participants to articulate their responses comfortably [53,60]. The disadvantage of this approach is the fact that the data that interviewees share may be biased by the interviewees’ perspectives, experiences, and knowledge . The data collection process entailed semistructured interviews employing a list of open-ended questions . Before initiating any interviews, an interview protocol was established with a list of the open-ended questions. Participants were interviewed in a mutually convenient location and at a time agreed upon by both of us. When the interviewee arrived, s/he was kindly thanked for coming, and permission to record was sought. The consent form was signed, and participants were reminded that the meeting would last approximately 60 minutes. All interviews were audio-taped. After the interviews, I transcribed the gathered data and coded the interviews. The process allowed the themes to emerge using an inductive method of data analysis , to develop a code list, and then to collapse the coded themes into categories . I coded the descriptive qualitative data the respondents provided when we met to establish coding descriptions and to identify themes  from an inductive approach. Consequently, the qualitative data were examined searching for patterns ideas. The coding process was developed using an individual ideas level coding process allowing the ideas of the data to emerge and identifying the themes that became the common categories. The process enabled me to organize the data into chunks or segments of text establishing a general meaning from each segment . Then, similarly coded items were collapsed into broad common categories identifying the themes. These categories became the means to consider the qualitative data . Finally, I established the six themes that reflected the major categories of data. Twelve participants were interviewed to gather the required data for this qualitative case study. Nine interviewees were MEGE professors (75%), and three were MEGE directors (25%). All the participants were white, and eight participants (66.66%) were women, evidence of the non-discrimination commitment the university has with female professors. Of the professors and directors interviewed, eight (66.66%) had studied to be professors of the disciplines they teach, three (25%) had a bachelor’s degree in the discipline they teach, and one was a sociologist with an MBA in Education. These facts reflect the interest and commitment of the MEGE professors and MEGE directors in relation to their work. Of the interviewed participants, eight (66.66%) were part-time equivalent professors, three (25%) were full-time professors, and one (8.3%) was a part-time equivalent professor who worked at the university 11.25 hours a week. The interviewees had worked in the EBP of the PCU from 1 to 8 years. The participants were asked 14 questions in the interviews. The interviews varied from 40 to 60 minutes in duration, depending on participants’ years of experience and the amount of information they elected to share. The use of descriptive data allowed me to enlighten the data gathered during the interviews. I developed a code list and collapsed it into categories . Words were analyzed first, followed by ideas and then sentences. Major themes were noted when more than 50% of interviewees mentioned an idea. Using the same method, minor themes were established when 49% or fewer professors or directors mentioned a specific idea. Table 1 provides a list of the codes I used in this study with a description of each code. After I coded the transcript, I calculated each code’s frequency and ranked them according to the relative frequency of occurrence in the interview data. I combined the codes that were related to topics and established a category according to the frequency of the codes, grouping together the codes related to various emergent themes. From the grouped data, six themes emerged: three major themes and three minor ones. The three major themes that emerged were: (a) lack of commitment, (b) students’ academic weaknesses, and (c) remedial courses. 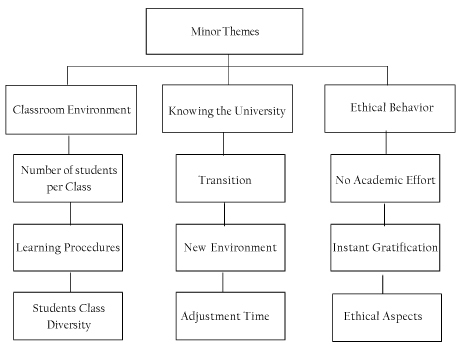 The three minor themes that emerged were (d) classroom environment, (e) knowing the university, and (f) ethical behavior. The participants indicated that the university leaders bore a major measure of responsibility for the codes related to Students’ Academic Weaknesses. Their view arises because the higher education institution allows the freshman students to enroll without analyzing their profiles or their knowledge weaknesses. If higher education institution officials were fully aware of students’ deficiencies, this would generate a commitment to provide the freshman students with workshops to enable them to overcame their academic deficiencies. Furthermore, identifying the students’ knowledge weaknesses implies that students may be furnished with the opportunity to fill their learning gaps by developing appropriate learning and studying strategies. The interviewed mentioned that the higher education institution has an important responsibility in regards to remedial courses. The goal of university support is to assist the EBP freshman students to develop the correct behavior, in order to be able to overcome the academic learning challenges they will face while pursuing their degrees. The EBP freshman students require that the higher education institution administration and professors make a commitment to help them minimize their completion time. MEGE professors and MEGE directors established that university administration and directors need to shoulder the responsibility for the institution’s environment and its consequences. Accordingly, if professors were informed regarding student diversity and if the classes were smaller, the professors could develop and implement learning procedures that may support the EBP freshman students to improve their academic performance. The participants indicated that the university needs to become aware of the challenges that EBP freshman students currently face. Accordingly, the university should take responsibility for supporting freshman students in their transitional process, giving them the required adjustment time to help them adapt to the new environment they will face while pursuing their degrees. Not only does the university have responsibilities to students, but students must also be responsible for their own success. One MEGE professor indicated that EBP freshman students need to be aware of their responsibility in the ethical behavior theme. The EBP freshman students need to come to terms with the fact that they must commit to their university learning. The instant gratification, the lack of academic effort, and the ethical aspects they were accustomed to in high school are not compatible with the higher education environment. The postsecondary education environment requires students’ engagement; to guarantee they are learning the essential topics while they are pursuing their degrees. 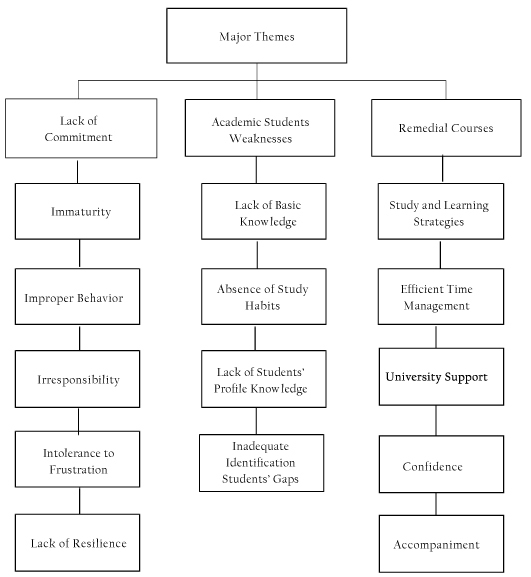 The first major theme identified was the lack of commitment demonstrated by freshman students of the EBP.Eleven of the 12 interviewed participants suggested that the immaturity and improper behavior of the freshman students, their irresponsibility, their inability to tolerate frustration, and their lack of resilience hinder the development of an appropriate learning environment. Consequently, the students do not learn the information and skills required to advance with a strong academic foundation. Participant 3 mentioned that many EBP freshman students were immature, lacked structure, had weak study habits, and little engagement with their postsecondary education. Those attitudes exacerbated their lack of commitment by impeding them from understanding the appropriate behavior they needed to implement in order to have a successful higher education. Participant 12 said: A private university like ours that receives an immense diversity of students knows that some students not only have great academic deficiencies due to inadequate secondary preparation, but also serious personal problems. It needs to be cognizant of students’ lack of commitment and therefore develop a teaching-learning commitment strategy for those students. To the interviewed was important to know the freshman profile because the freshman students’ backgrounds impact their academic performance. The participants acknowledged that many freshman students exhibit weak critical thinking and logical reasoning skills. Of the 12 participants eight thought the lack of commitment on the part of most students was most obvious. On the other hand, one MEGE professor said that only about 50% of the students lacked commitment. The interviewed perceived that most EBP freshman students exhibited academic weaknesses. The freshman students’ knowledge gaps, the absence of study habits, the higher education leaders’ insufficient awareness of the students’ profiles, the inadequate identification of students’ academic gaps, and the lack of students’ internal motivation, all combine to block the development of a healthy atmosphere where learning can flourish. MEGE professors emphasized that, if they did not spend significant amounts of time in their classes reinforcing the previous subject matters, students were unable to internalize course subjects. The MEGE directors added that, as a consequence, MEGE professors frequently spent their class time explaining previous topics and did not have enough time to explain all the subjects contained in the current course’ syllabus. Of the 12 participants interviewed, six professors and two directors identified academic students’ weaknesses as a major issue that thwarts the learning process due to the lack of appropriate tools to internalize the knowledge the professors impart. Participant 9 mentioned that EBP freshman students indicated that they had not learned how to study in high school. In addition, students did not have a concept of learning; they did not realize that they had, in fact, learned when they internalized the theories and could answer the questions and problems the professors give them. Of the 12 participants interviewed, five professors and one director identified the absence of remedial courses as a major issue that frustrates students’ learning processes because they do not know or use the correct learning and study strategy to incorporate the knowledge professors taught in class sessions. Participant 10 stated that the directors of an institution of higher learning must make a commitment to support students by providing remedial courses to overcome their learning gaps. Accordingly, writing skills are essential tools to express students’ ideas and are the foundation for achieving successful learning outcomes. Two MEGE professors and the three MEGE directors interviewed described the number of students per class (60, on the average), the learning procedures students used, and the enormous diversity of students in each class as obstacles to the development of a healthy learning environment. The confluence of these factors obstructed professors’ efforts to support each student in identifying and improving his/her weaknesses. Of the 12 participants interviewed, three professors and one director affirmed that classroom environment was an issue that discourages the freshman student learning process, because professors are unable to devote enough time to support the learning process of each freshman student. One MEGE professor and one MEGE director argued that freshman students faced a challenging transition from the high school environment, where the students knew all the rules and someone always told them what to do. However, at the university, students encounter complete freedom and must organize their time and studies on their own. Participant 4 added that many freshman students of the EBP were waiting to get all the instructions from the professors and did not realize that the goal of teachers is to support students in learning to think. Accordingly, the EBP freshman students need an adjustment period upon entering the university, to learn these new responsibilities and devise methods for organizing and fulfilling those duties. Of the 12 interviewed, two MEGE professors identified knowing the university as a minor issue that obstructs the development of a successful learning process for freshmen. These respondents point to the fact that EBP freshman students did not know, but needed to learn, the rules of the new academic environment they face so they could become successful, academically. One participant interviewed considered the idea of ethical behavior of great importance. Participant 10 said she had felt that some students did not want to make an effort to learn, yet demanded immediate positive learning outcomes. She expressed concern for the ethical consequences such behavior can generate in the students when they enter the labor market. The major and the minor themes that emerged from the data gathered through the one-on-one interviews conducted with the MEGE professors and directors are exhibited in Figure 1 and Figure 2 respectively. Figure 1 and Figure 2 also display the codes that comprise those themes. Major themes identified from the data. Figure 1: Major themes identified from the data. Minor themes identified through data analysis. Figure 2: Minor themes identified through data analysis. The study’s findings support the idea that freshman students require supportive academic strategies. Such strategies may provide higher education students the tools they need in order to improve their academic performance in MEGE courses. Also, such support strategies may shorten the length of time students spend completing their programs [6,43,34] and contribute to positive social change. Higher education students must develop learning strategies to succeed in their academic process. These students need to study diligently on a regular schedule, should take advantage of class time to clarify their doubts and misunderstandings, and should responsibly take their examinations on time [62- 63]. The requirement is to help student establish effective study and learning habits that may be based on collaborative relationships with their professors and with their peers. According to Paul and Fitzpatrick and Turner [64-65], an important prerequisite for the successful implementation of a learning strategy is the higher education student’s perception of an active professor-student relationship and a supportive institution. This means that, first, students perceive that professors can provide them appropriately available support. Second, that appropriate . Third, that the higher education institution must provide adequate academic and social environments where students can identify personnel who are genuinely concerned about them [64-65,67]. Finally, Cox and Lemon , identified the rapport between students and their professors as an essential factor for improving freshman student academic performance. On the other hand, higher education institutions need to encourage active participation of freshman students in professional and social events because freshman students’ persistence and retention are influenced by the support the postsecondary institutions provided during the initial years . Russell et al. found that when students develop an active learning behavior, organize their work, and prepare for classes, they grasp the importance of a commitment to their learning process, and consequently, adopt more appropriate learning strategies. The outcome of these new learning strategies is a virtuous cycle because as the students adopt improved learning strategies, they come to realize this new approach will provide a solid foundation that will result in improved grades . Baier et al., Cholewa and Ramaswami [71-72] noted another significant topic is the support higher education institutions should provide freshman students. Moreover, supportive approaches reduce the odds of attrition by helping postsecondary students to improve their passing rates. Pereira et al. recognized that academic feedback provided by the professors at the appropriate juncture during the semester, facilitates the learning process by allowing students to acknowledge their weaknesses and improve their learning strategy at the opportune moment. Finally, Cantrell et al. and MacArthur et al. [74-75] described how remedial courses improved student academic performance, increasing their self-esteem and motivating them to pursue topic mastery. Bonet and Walters, Branson et al., Khong et al., and Sanders et al. [76-80] identified a positive relationship between class attendance and the final grades the students earn. However, Khong et al. established the main reason for encouraging class attendance should be that it would lead students to improve their grades. Class attendance allows students to identify the topics that professors consider most important, receive guidance for exams, and to learn to take lecture notes . Furthermore, Sedden and Clark  contend that one factor that should be considered is that students value their personal time and need to see that assignments support their learning process and are related to their future professional development. Ensign and Woods  noted that when faculty foster appropriate learning environments, students develop their strengths and minimize their weaknesses. Such healthy learning environments provide students with the confidence required to overcome the learning challenges they may face . Gajewski and Mather  identified that when professors used diagnostic assessments, students’ learning outcomes increased. At the same time, the educators’ caring and supportive behavior were important characteristics that supported the students’ learning outcomes . Besides, Hieb et al. and Swail [84-85] illustrated how remedial courses could be an essential cornerstone to assist students in identifying appropriate learning strategies and useful approaches for implementing time management strategies. The strategies used to validate the accuracy and credibility of the findings were triangulation, and member checking. Triangulation is the process through which researchers compare various sources of data or the participants’ perspectives . The process allows them to test the “quality of the evidence” . Instead, member checking is the process researchers employ to ensure the accuracy of the evidence they gather [54,87]. Researchers send the transcription of the interviews or their conclusions to the participants to ensure the accuracy of their interpretation of data that were gathered . Accordingly, the first strategy I used to validate the accuracy and credibility of my findings was triangulation. I asked the directors of the MEGE departments about their opinion, and I compared their points of view with the perspectives of the MEGE professors I interviewed. Furthermore, the second strategy I used to validate the accuracy and credibility of my findings was member checking. After I transcribed the qualitative data from the interviews, an email with the transcription of his/her interview was sent to the participant, and that person was asked to verify my interpretation of the information that had been provided [54,87]. Within three weeks, all participants had answered my email; all confirming that my interpretation of the data they shared during their interview was accurate. The data generated by the interviews I conducted confirmed that the MEGE professors and directors perceive that they are able to support EBP freshman students, with backing from the university leaders. Professors have a relevant role to play in the freshman students’ academic success [62-63]. Additionally, McEwan, Strom and Savage [25,40] established that the freshman social environment influences their educational process and their decision to pursue a degree. The above mentioned is accomplished by raising student passing and graduation rates and, subsequently, producing individuals with the skills required to positively impact national development. Based on the data collected, the findings of this qualitative case study may prompt university officials to develop a comprehensive strategy that fosters the implementation of appropriate supportive measures to improve freshman student academic performance. Students deserve to receive the necessary guidance to improve their academic performance at the university. Accordingly, once PCU officials accepts freshman students, these leaders became the institution’s representatives to provide the required academic structure that will enhance student academic performance and develop academic success at the university. Finally, this qualitative research project generated a question beyond the scope of this study. The question for future research concern one area: Are there quantitative or mixed research methods more useful than qualitative work to address these issues, because survey data yield rich quantitative data unavailable through interviews. Any case study may have specific limitations. First, as a result of the study’s qualitative nature, the findings are not being generalizable. Second, the study was bounded at the EBP of a PCU. Consequently, if a researcher were to conduct the same study at a different private or public university, or within a different academic program the, findings may differ. Third, the study documented the opinions of nine MEGE professors who taught one cohort of freshman students of the EBP, and three MEGE department directors who coordinate the MEGE professors. For this reason, if a researcher conducts the same study with a different sample of MEGE professors or with a different group of MEGE directors, the findings may differ. Fourth, the study included academics who taught MEGE courses of one cohort of freshman students, and so the perceptions of professors who may have resigned, were fired, did not instruct that cohort, or choose not to participate were not collected. Further research should be carried out to establish the perceptions of other MEGE academics, professors or directors, from other disciplines; at private or public Chilean universities on the extent they support freshman students to improve their academic performance at MEGE courses.Additionally, future research may benefit from including the freshman students’ opinions on how their MEGE professors have encouraged them to improve their academic performance. Although this study lacked quantitative data, such as GPA and retention rates, the knowledge the study provided will enable the PCU to develop interventions and implement strategic policies that may support the EBP freshman students in improving their academic performance in MEGE courses.